The poles are 75cms long and 36cms thick and made from 36mm PVC tube with a 13cm x 8mm stainless steel spike moulded to ABS insert solvent welded to the poles to hold them firmly in the ground. Do you want to make your puppy dog have healthy body, amazing agility and real emotional communication with you?. Look at our newly designed Dog Jump Hurdle Poles. This is a great pet supplies for training dog's agility. Set of 6 Hurdles with Carry Bag - 9" high (23cms). 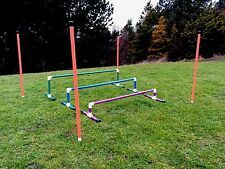 Set of 6 hurdles constructed from high impact PVC. Shatterproof and Virtually Unbreakable. Complete with tough nylon carry bag. 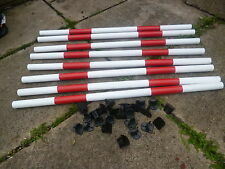 I Have For Sale 10 plastic Jump Poles For Use In Agility Training. 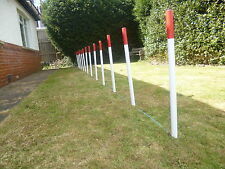 they are quality plastic 100cms x 35mm dia and caped at both ends. T he jump pole height can be adjusted by sliding the rubber restrictions up and down the upright poles. The upright poles are held in the ground by galvanised steel spikes. johns agility 6 ABS coloured Weave Poles with KC webbing training. The poles are 74cms high and 36cms thick and made from 36mm ABS tube with a 13cm x 8mm stainless steel spike moulded to ABS insert solvent welded to the poles to hold them firmly in the ground.they are totally maintenance free and available in 4 colours. The Outdoor Dog Agility Kit has the bonus of keeping your dog’s senses sharpened and brain occupied too. Most dogs can do very well and have lots of fun in agility, as it is relatively easy to learn. Or just key on to johnsagility. This Barkshire Dog Agility Jumping Hoop can easily be adjusted to fit your dog's jumping ability. It is perfect for your back garden or the park and is a great way to not only hone your dog's co-ordination but also improve overall health though physical fitness.